When you start entering the data science world, things can become really messy. There are thousands of concepts and meanings, most of them thrown at you at the same time. Usually, most tutorials and texts focus on languages to be studied but this time I decided to bring something different. In this text, I brought some “simple” explanation for some of the most common tools used on data science development. Although sometimes the tools is attached necessarily, the idea is to explain more about the tools then what each language can do. This is not a text about how to open a spreadsheet and process data, but where data science tools live and which has the right things for you. Virtualenv is a Python tool developed to isolate development environments. It is really handy when you need to isolate projects that use different versions of Python and packages. 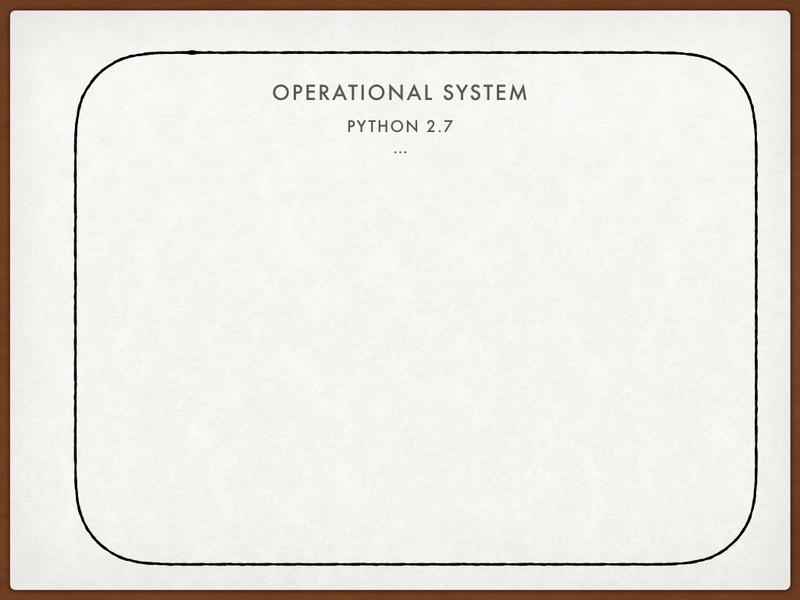 It is specially good if you consider that some operational systems use Python as a default tool. Imagine that your system uses a specific library with a specific version. Change it can cause severe complications on your whole system. So, you definetely should be careful. 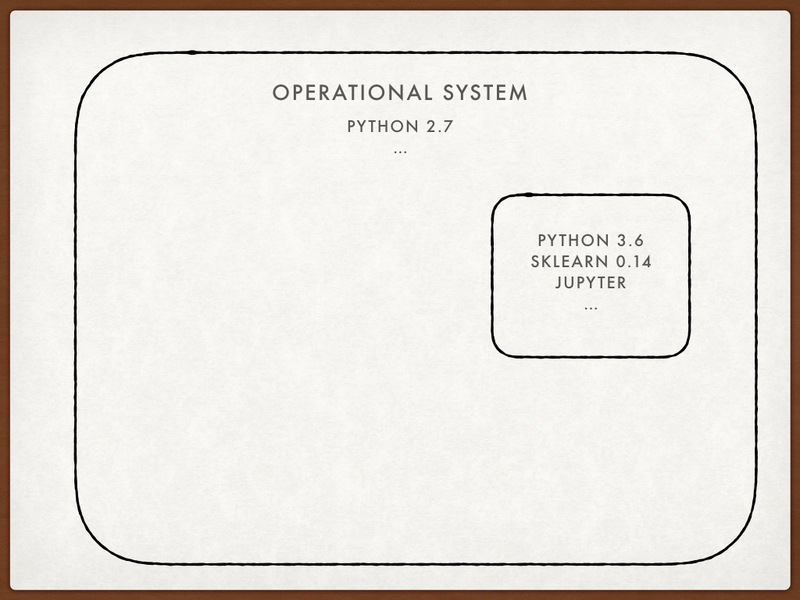 Your operational system is like a box, with a specific version of Python and the Python libraries it needs, which specific versions it needs. Creating a virtualenv is like you created a “little box”, and inside it you can install whatever you eant: any version of Python and any version of the libraries you need. Since you created a “little box”, what’s in it is completely isolated from your general environment, and it can be easily deleted if you stop working on that project. Since you can create multiple virtualenvs, each project can (and normally should) have its own “box”, making easier to manage packages and libraries for each project, always keeping your operational system intact. You can have as many virtualenv as you like inside your operational system. Project Jupyter is an open-source project that creates tools to help people develop scientific computation and data science in an iterative way and multiple languages. Usually when people talk about Jupyter they probably are talking about Jupyter most famous tool: Jupyter Notebook. Notebooks were created in 2014 and quickly became famous on both academic and business world. It is an development environment that allows you to write code, text, create graphics, add formulas, videos and much more in a single place. It is extremely powerful, for instance, to give lectures. All theoretical concepts and the code that show how to apply it can be in the same document. A cool example is a series of 12 notebooks made by Professor Lorena Barba that shows how to implement in Python the complex formulas of fluid dynamics. Since this is not an easy task, each notebook gets more and more complicated. Notebook example. Each cell is independent from the other an can either contain text or code. When you run a Jupyter server on your computer, the system will open in a browser. This makes easy for users that are not very technical or have trouble with command lines. All files are saved with the extension .ipynb and can be exported to HTML (to open in any browser) as well as to PDF. Spyder is an environment focused on scientific computing and data science with Python. 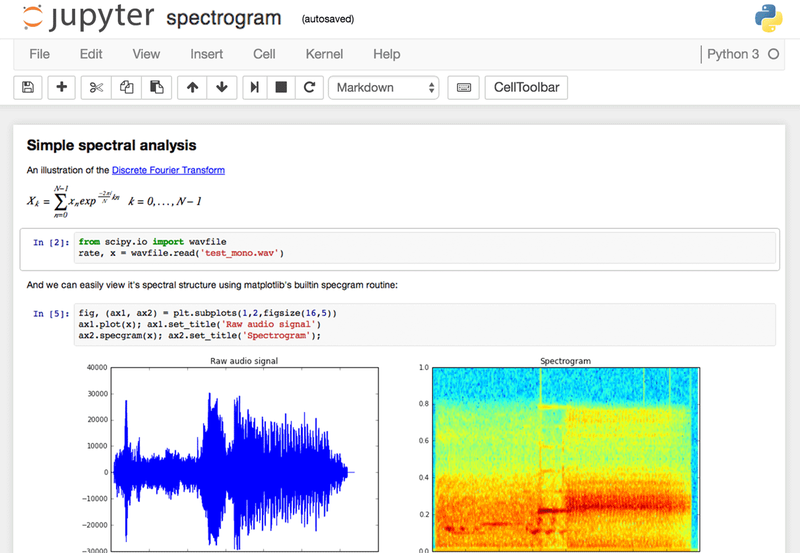 Unlike Jupyter Notebook, Spyder is a Desktop application. The program has an area for developing your code, a terminal to run code and the script and and an area to visualize the variables that are loaded in memory. It also has tools for checking code quality and quick shortcuts for accessing documentation, which makes life pretty easy for begginers. A cool thing about Spyder is that it also have a plugin to use and create Jupyter Notebooks inside the Spyder platform. Spyder interface. On the right there is the available files on the directory, next to it the script that is being developed, then error verification. On the upper right you can see variables loaded and on the lower right the terminal with the figures plotted by the script. Similar what Spyder is to Python, we have R-Studio for the R language. R-Studio contains an area for script development, terminal and variables available. It is also an open-source tool and has versions for both Desktop and browser. It also has a kind of “notebook” available, called RMarkdown (extension .rmd). This file is similar to a Markdown file, but with more options. Like Jupyter, it allows code and text to exist in the same document in an organized way. It can also be exported by HTML and PDF. 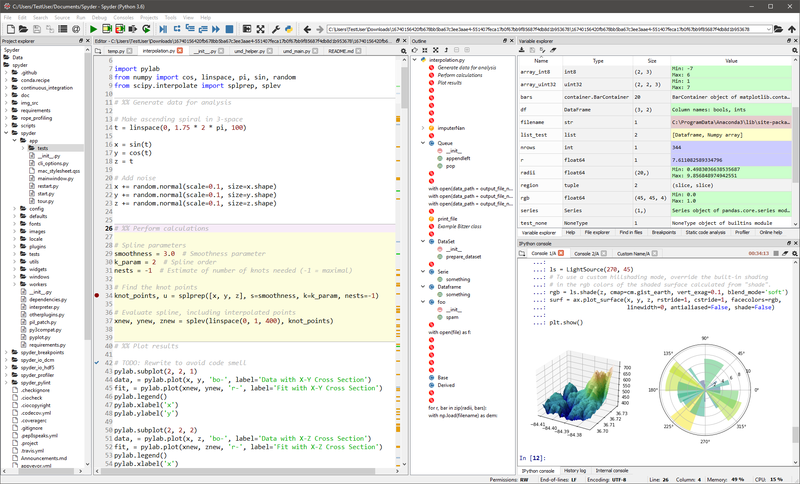 R-Studio interface. On the lower right a documentation area and access to the documents available on the directory. On the upper right you can see available variables. 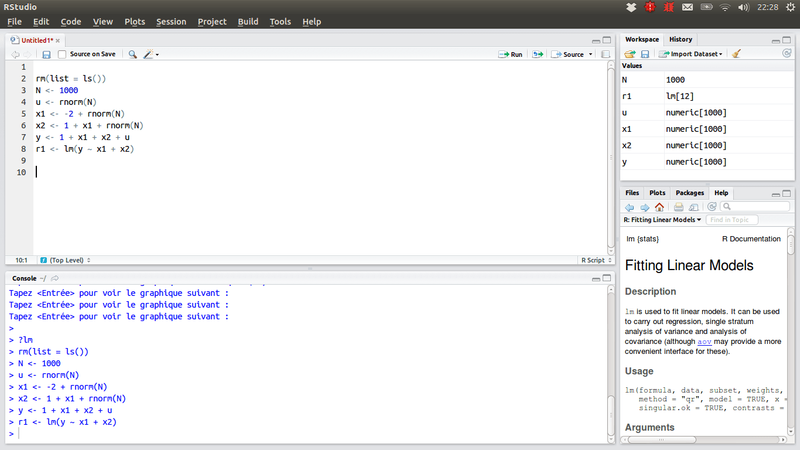 On the upper left the script that is being developed and on the lower left the terminal to execute commands. 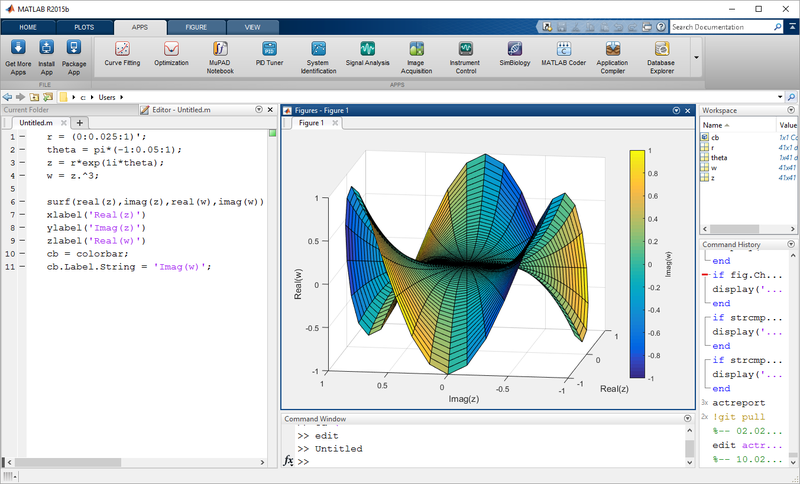 MATLAB is a software focused on numerical calculus, based on matrixes (MATrix LABoratory). It is a proprietary software (and not a cheap one), available for Desktop and with its own language. Since the language only exists inside the software, we usually say MATLAB as a development environment and programming language. It is widely using for research by the schools, but its high costs makes it not a good tool for wide use. It generates files with extension .m. 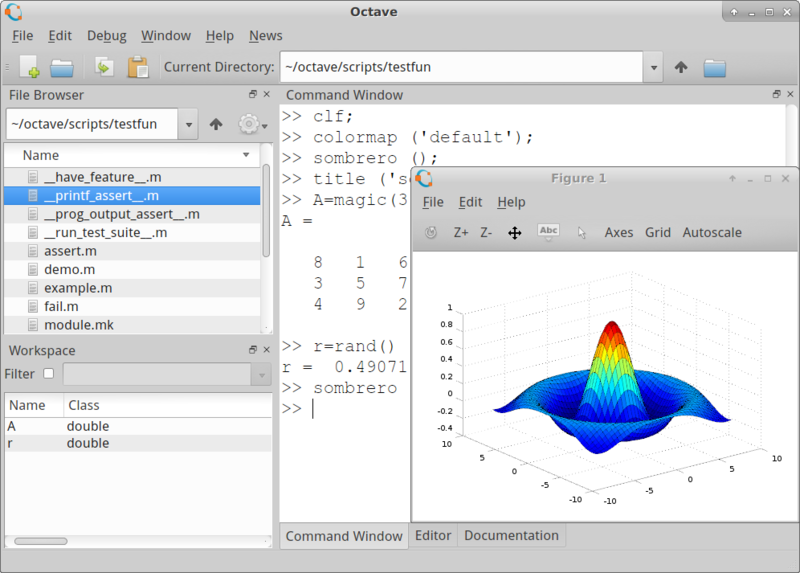 MATLAB interface. At left the script that is being developed, on upper center a space for plotting images, on lower center the terminal, on upper right the available variables and on lower right the history of commands typed on the terminal (command line). Differences exist, but can be worked on the software preferences. Octave interface. On upper left the files available on current directory, on lower left the available variables and the terminal (command line) is on the right, with an image over it. When you actually go to work with data science, you often need to use packages (also called modules or libraries) that others have created to make your life easier. Spyder and Jupyter are examples of this kind of packages. Pip is a tool that manages the installation of Python packages. 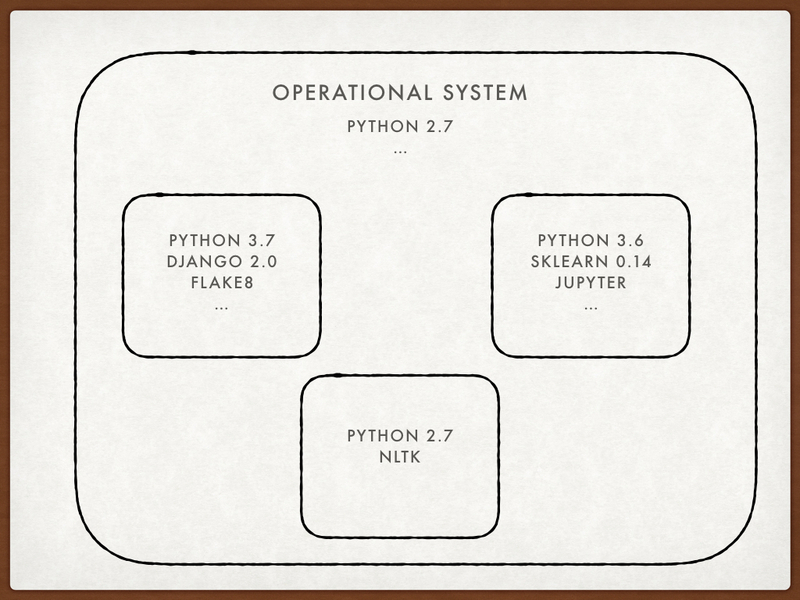 It contains over 600,000 projects, which makes it ideal to install any Python package you want. Important: R, MATLAB, and Octave do not have specific dependency managers. 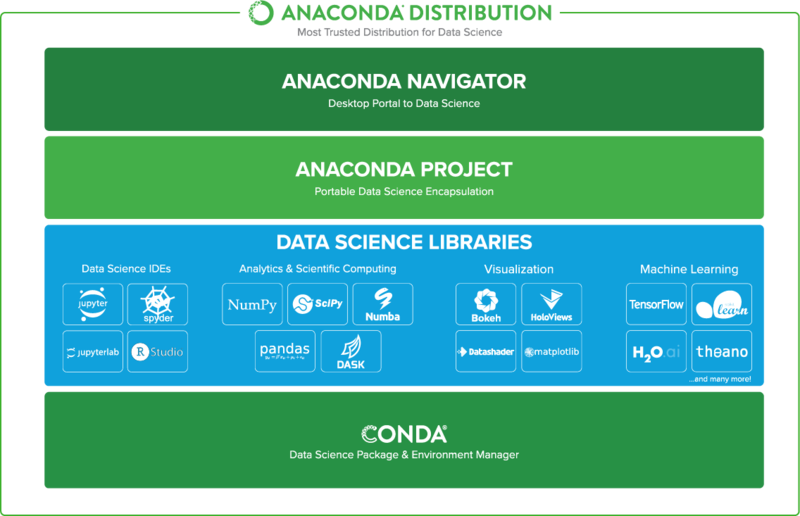 Anaconda is a free and open source distribution that aims to facilitate the installation, use and deploy of both R and Python data science tools in any operating environment (Windows, Linux and MacOS). Basically it is an installer that already have everything ready for you to start using and working in the area. When you install it, it usually install all main libraries and tools that you’ll probably use, like Pandas, Jupyter and Numpy. Because it handles with of a lot of things, the installation is a bit more robust and requires more space on your computer. The Anaconda distribution is then composed of some parts, as shown in the figure below taken from the project site. Although it has been built as the basis of the Anaconda, it can be installed totally independent to Anaconda. It occupies far less space than the great infrastructure of Anaconda, with a very large power. Conda is especially good for managing packages that need dependency from other languages or programs. Imagine that you need to install a package that depends on a tool in Java … Installing each part can give a lot of headache, especially if we talk about Windows environment. Conda abstracts this difficulty for you. Imagine that you made a beautiful and wonderful code, but your colleague had a brilliant idea and wants to test and improve your code. He/she does not need to go to your computer! It changes a file and sends the fixes to you. But how to know what he/she has done? What was changed, when and by whom exactly? That’s exactly what Git does. Git is a system that controls versions. With it it’s possible to know who changed what, when, where and all the comments that the person made while making the changes. It is one of the foundations of software development these days and data scientists should know how to work with it.